Over the past two weeks, the folks in the ISWO course have been experiencing a range of online learning opportunities, including discussion forums within Moodle, wikis, conferencing via Elluminate and blogs. These tools are being introduced for the purpose of exploring online community building and probably for most of the participants, at least one of these tools is an unfamiliar thing. As ISWO blog steward, I am seeing really interesting observations in the early blog postings and I have had quite a few comments to make. Also, I am making the effort to connect bloggers (from within ISWO) whose ideas might inspire or challenge each other. Depending on how you've set up your blog, you may get email notifications when someone has commented. Don't forget to return to your blog to see how people are responding. Comments are starting to appear, and there should be more soon since it's a designated activity in the course. So this is a community in early stages - part of a course requirement but hopefully also something real. 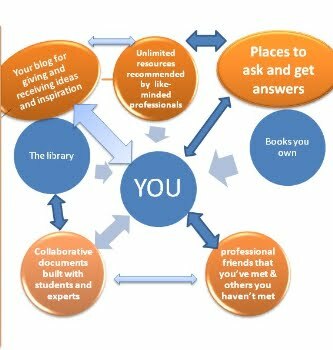 Blogging is a form of self-expression and sharing and my hope is that for some of you, it's a process that that might be retained after the course is over as part of the authentic personal learning network.